Welcome to the websites of Lietlahti organic farm! The roots of the organic carrots produced on our farm are in a pure and living soil! Together with our contract producers, we produce every third of Finland’s organic carrots. Our biggest customers are Inex Partners and Kesko. Kesko’s Pirkka organic carrots have been packaged on our farm since 2004. Other customers are various refiners of organic carrots. 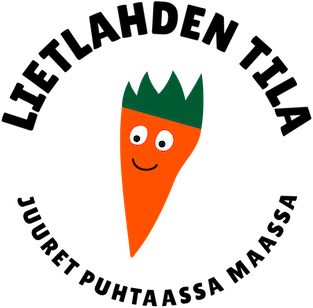 Our organic carrots and parsnips are marketed through Tuoreverkko Oy. Our goal is to achieve high quality from the beginning, both in products and in practice. We strive for overall environmental friendliness, and in addition to organic farming, the electricity used in our farm is ECOEnergy-certified and partly self produced with our 37,8 kW solar plant system. Cultivation and packaging operations are audited by the Finnish Horticultural Products Society and have received a Laatutarha-certificate. Check out our farm products, packaging facilities, farm history or enjoy watching photos and videos from the gallery.